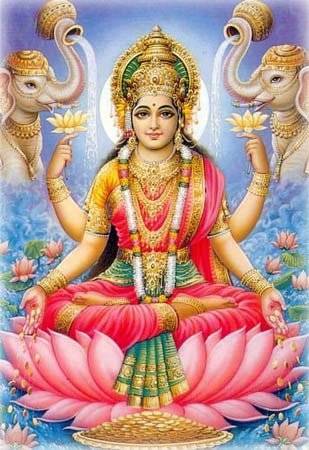 Lakshmi is a goddess who embodies herself in all forms of wealth. She is in jewels, coins, rare items and all children born to welcoming parents. She is believed to symbolize the wealth of the earth and the souls that live upon it. 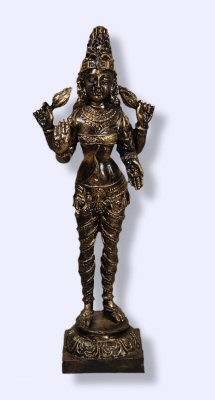 Lakshmi is a fair lady with four arms, dressed in fine garments and seated upon a lotus flower, which is a sign of ultimate enlightenment. Lakshmi does not have a temple in her honor for those who worship her do not believe they can contain one whose power is so strong. It is believed that Lakshmi can hear your prayers no matter where you are. She is often called upon for well being, personal health, financial stability and growth. If you chant "Om Ganesh" three times and then ask for Lakshmi's help she will hear your prayers. Lakshmi is also believed to respond to her worshippers when they are able to make declarations, such as: "I'm ready to find a new job that is challenging, with better pay and with Monday through Friday hours". In honor of Lakshmi I have created a Ritual Prayer that can be used to help bring prosperity and good fortune into our homes. Before I begin I would light a green candle in honor of Lakshmi. 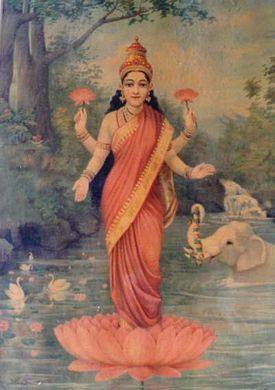 Since I often worship in front of my altar I have placed some silk lotus flowers upon it to help honor Lakshmi. "Great Lakshmi I call to you and honor you. I honor your strength, your charity and your humbleness. 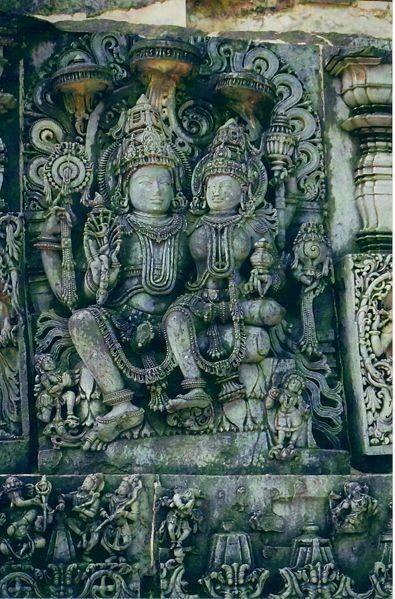 Lakshmi I'm seeking your guidance to a path of financial comfort and well being, and your help with seeing the signs that are placed before me, that my Path is right and true." I would repeat this prayer over and over as I focus on my path and my end desires, until the candle has been allowed to completely burn out. Since Lakshmi is helpful in so many ways, I would change the path request in the future to fit whatever issue I needed guidance with at that time. 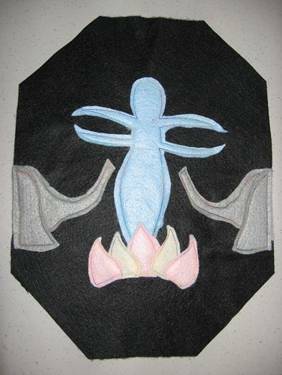 For my original art project, I made a felt hanging in honor of Lakshmi. This is an image I have been planning since I began my research on Lakshmi. I used pink and white to represent the Lotus Flower she is most often seen sitting upon. I made Lakshmi in blue to represent the air and bright sky she is often seen sitting in front of. I made the pattern simple since she is Goddess of the people and can be called upon in the most simple of ways. The stitching is done in jewel tone thread to represent her richness and the fact she if often seen with lavish jewelry to adorn her. Finally the elephants are often pictured with her and I they are powerful and intelligent animals. This portrait is important to me because it helped form a bond with this Goddess as I created her and also form a connection with the elephant which is a new animal to my path.